The 15th Battalion, CEF, was originally recruited from the 48th Highlanders of Canada – a militia unit based in Toronto. This finishes up the 3rd Brigade (which I should get around to taking a picture of all together) and the last of the Canadian units I need for REGINA TRENCH! Only two of the figures are entirely newly painted – the Piper and the Infantryman I converted to be carrying a Lewis gun. All others were previously painted – but recently rebased and I did a bit of touching up of most – the helmets and the formation patches, and in a few cases the kilts. 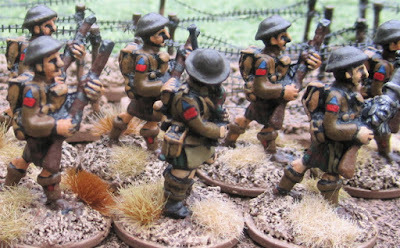 The Highland infantry figure that makes up the bulk of the unit (as with the 16th Battalion (Canadian Scottish) are figures I modeled and cast myself – in fact, this particular figure is the very FIRST figure I ever modeled. They’re not very pretty on close inspection, but I’m hoping in the tide of khaki no one will notice. 15th Battalion, CEF (48th Highlanders), 3rd Brigade, 1st Canadian Division. The unit formation patch is a blue triangle over the red patch of the 1st Division (blue, being the colour or the junior brigade in the division, and a triangle to denote the third battalion within the brigade). They look great, as you said a big mass of khaki and the formation signs help them stand out.